Have you ever heard of the term or saying, “YOLO”? YOLO means, “You Only Live Once.” Kind of dumb isn’t it? I agree. Well people first started hearing YOLO when Drake, a hip hop artist, first said it in his hit song, The Motto in late 2012. When people, such as teens first heard it, it became very catchy. It was also being played a lot on the radio. Which is how the media gets your attention by repeating those catchy jingles. It was more directed towards teens. Teens began to use YOLO as an excuse for everything. For example, a teen could hit a car in a parking lot and think it would be okay. Then that’s when they yell the term, YOLO. Basically YOLO means do everything to the extreme because you might not be alive to do it tomorrow. That term was taken way out of control. The term also figured out its way to be apart of every sentence in someway. YOLO was a daily and frequently used word once it was first heard in Drake’s song, “The Motto”. 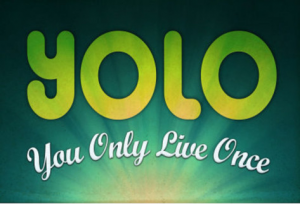 The term YOLO was then featured on clothing, hats, and even phone cases. This was all in the hands of teens who thought it was so cool and began to come more popular. If you do use the motto YOLO make sure that you are truly ceasing the moment through making good choices and not living once to just choose destructive behavior. A bad choice could not only affect your life forever but could also hurt someone else…even death.